There may come a time in your life when you are tasked with the project of moving or storing a dining room table. This can be a large project because dining room tables tend to be large, heavy and very expensive. Understanding how to properly move a dining room table will help to mitigate the chance of damage occurring during the move. Follow these tips to properly move your table! Clean the Table: Ensure the table and chairs are clean. Before you move your dining room table, be sure to dust and clean it with a manufacturer approved cleaner. This is especially important if you will be storing your table after moving it, as any leftover food or moisture on the table can turn to mold or mildew while it is in storage. Remove the Legs from the Table: Spread a blanket down on the floor and place the table upside down on top of it. The legs will either be attached to your table by bolts, screws or glue. 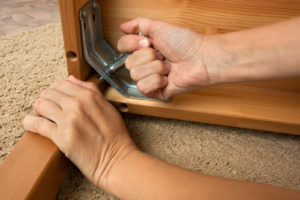 If the legs are bolted or screwed to the table, use a tool to remove the legs. Place any loose parts like screws or bolts in a bag and tape them under the table. If the legs are attached to the table with glue, try to use a putty knife to break the bond. If you are unable to remove the legs from the table, thoroughly wrap them in bubble wrap to protect them during the transit. Wrap the Legs in a Protective Material: In order to prevent the legs of the table from getting dinged up during the transit, wrap them in a protective material. Secure the protective wrap using tape to prevent the wrapping from coming loose during the move. Remove the Table Extension: If the table has a leaf or table extension, remove it before moving the table. Wrap the extension in a moving blanket and secure it using tape. Use packing tape to secure the underside of the table and prevent it from opening while the table is being moved. Cover the Corners of the Table: Prevent the corners of the table from getting dinged up by folding cardboard around the corners of the table. Use a Dining Table Protector: Use blankets to protect the surface of the table. Make sure the entire surface is covered then secure it using tape. Storage World has local storage units throughout Jonesboro, Stockbridge and Decatur, GA ready to meet your storage needs! We offer various self storage specials, making a storage rental with Storage World the clear choice! Are you interested in learning more about a storage unit rental? Contact one of our storage facilities today!